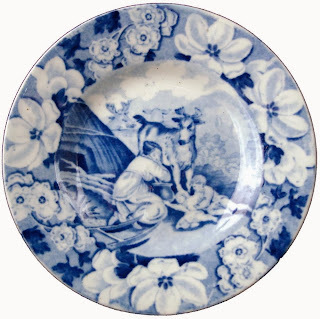 I recently focused on transferware dog patterns. 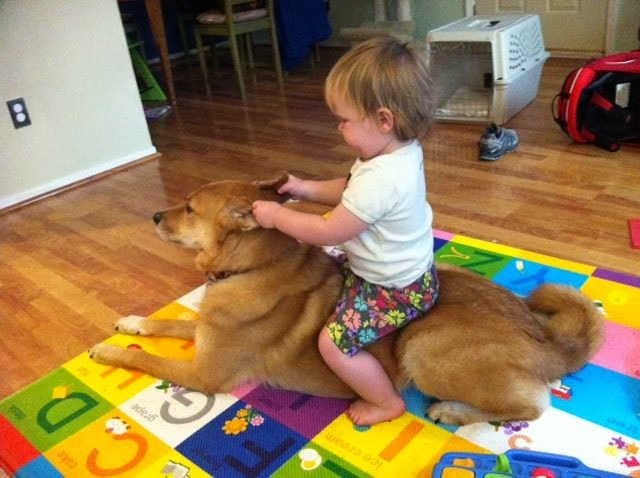 I suggested that many dog patterns are found on items intended for children. 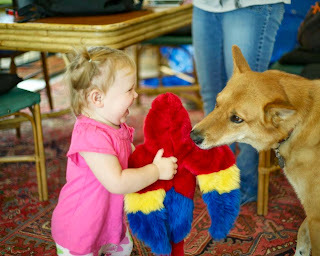 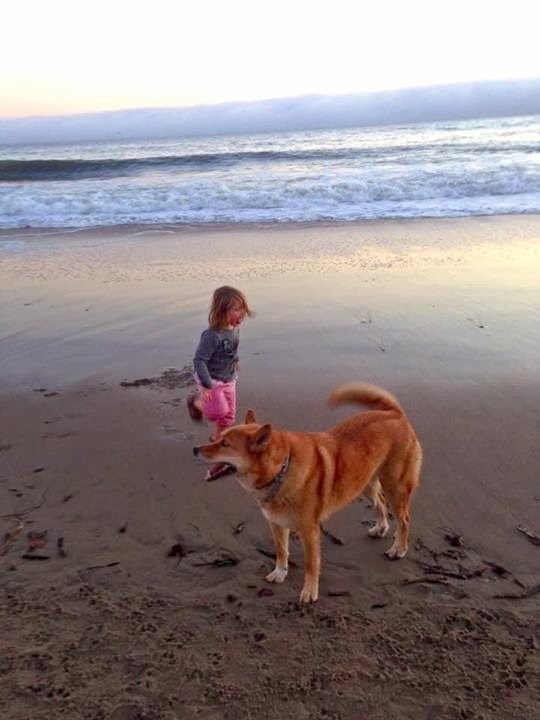 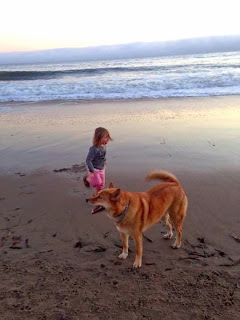 Here are a few that feature children and dogs. As you can see, I interspersed transferware patterns with photos of real children and dogs. 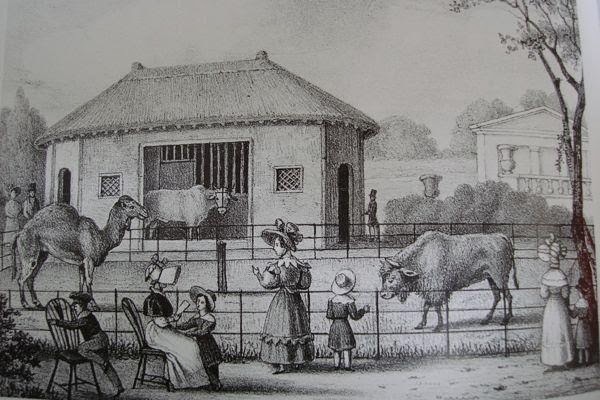 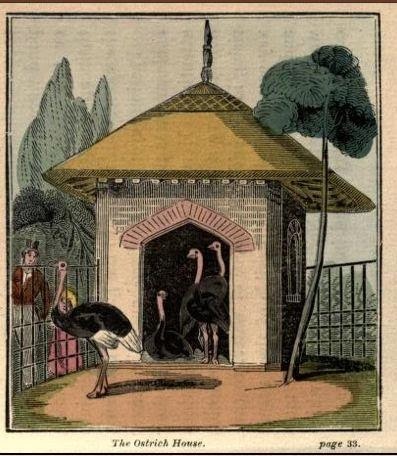 Obviously, the relationship between children and dogs has not changed in the past nearly two hundred years! 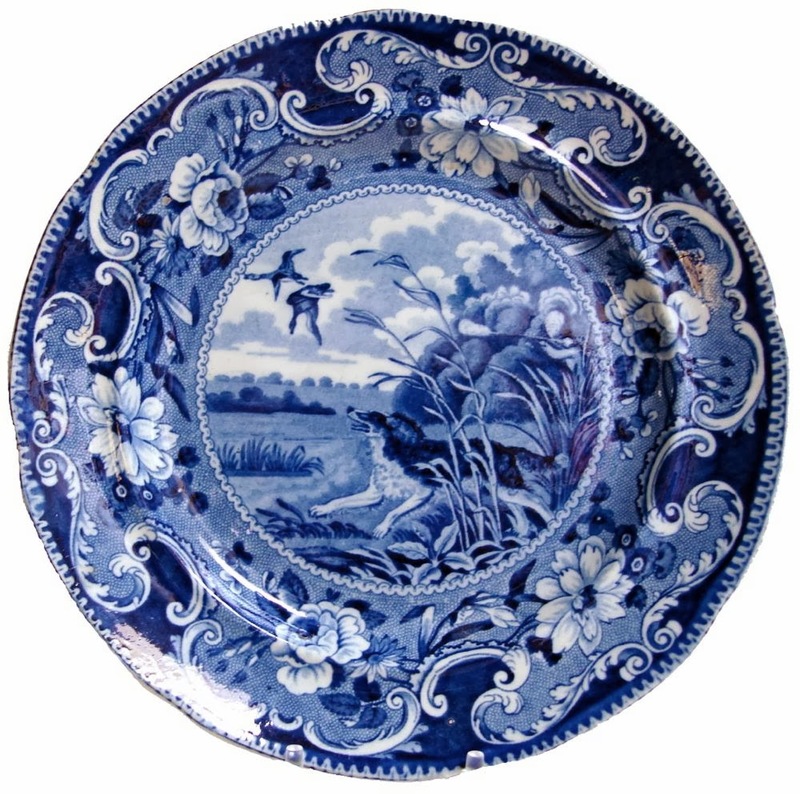 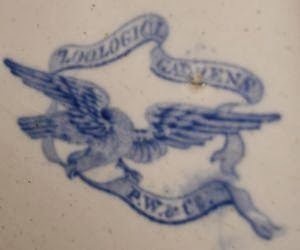 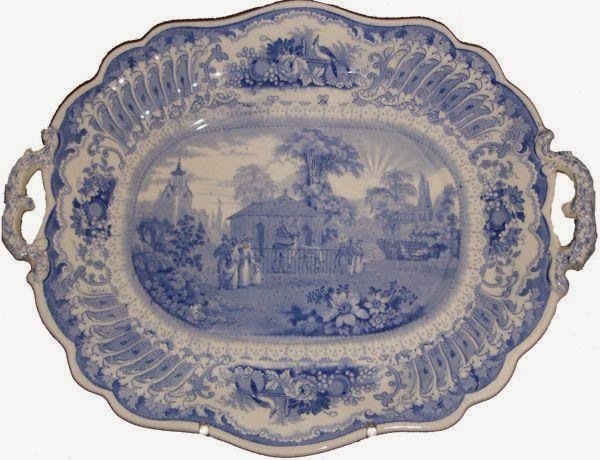 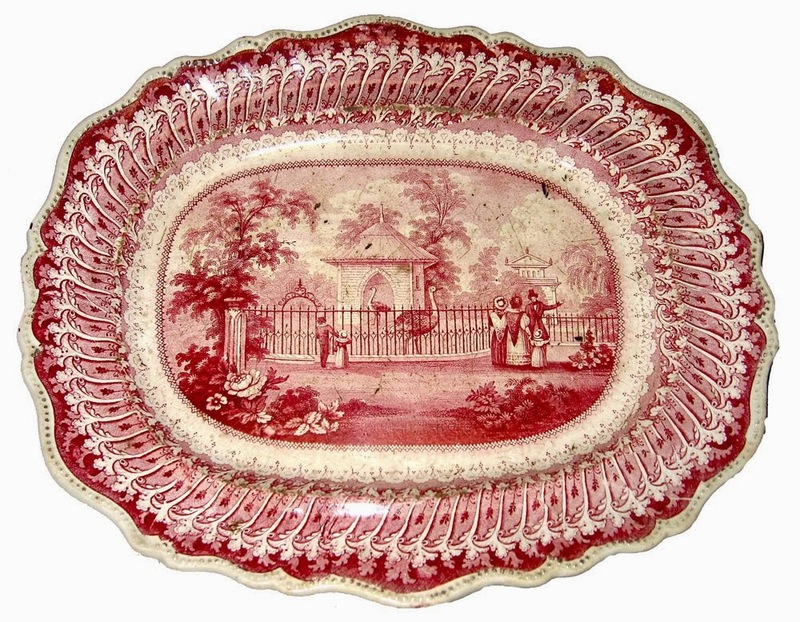 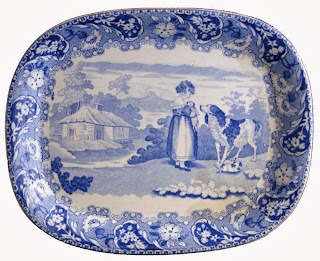 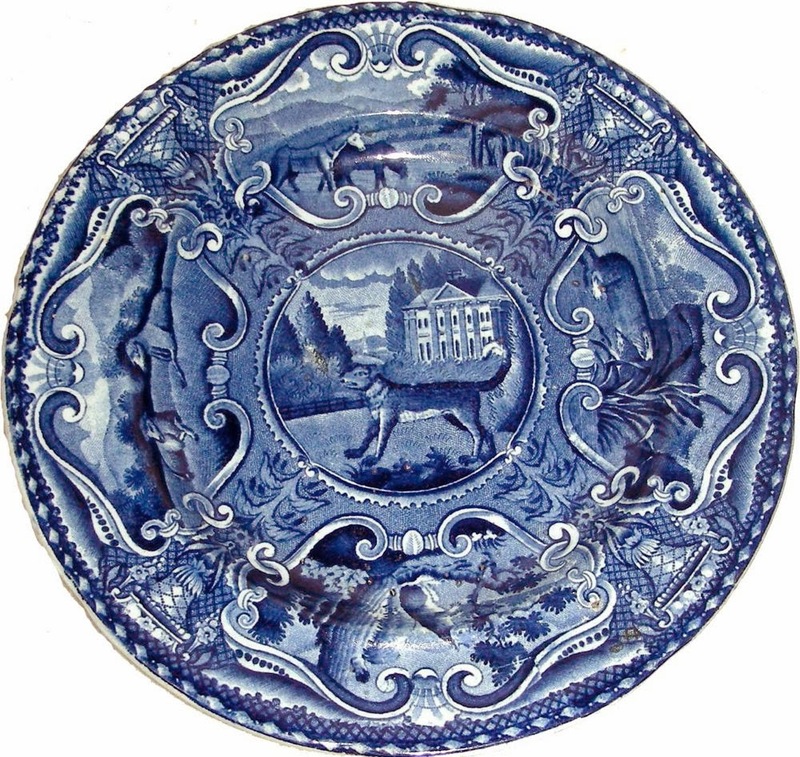 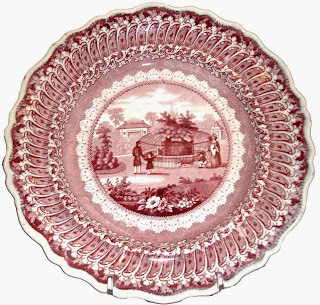 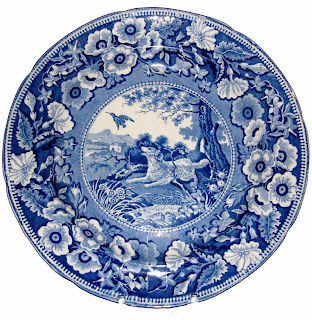 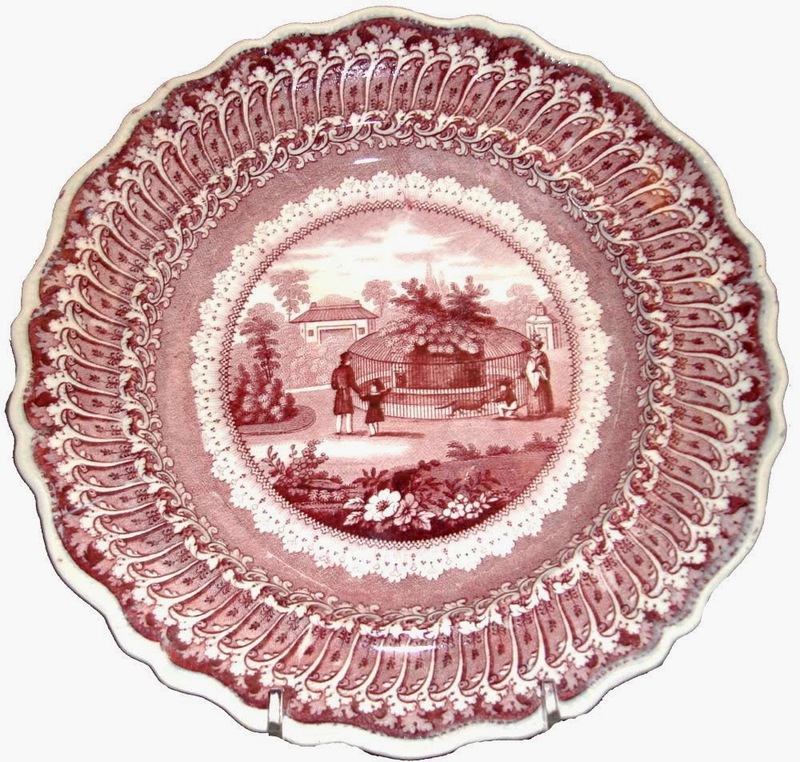 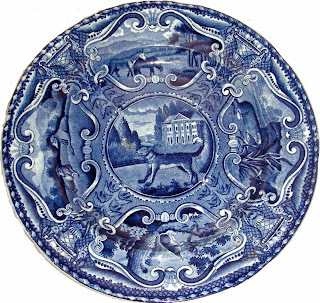 Probably Minton (1793-1872) 7.5 inch teapot stand, ca. 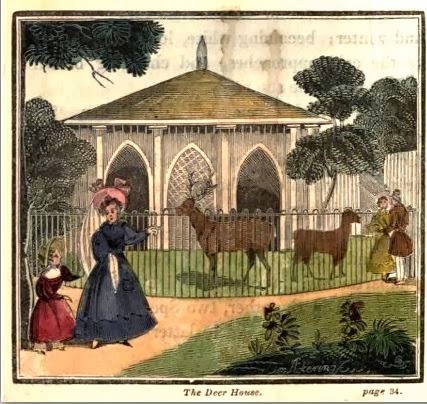 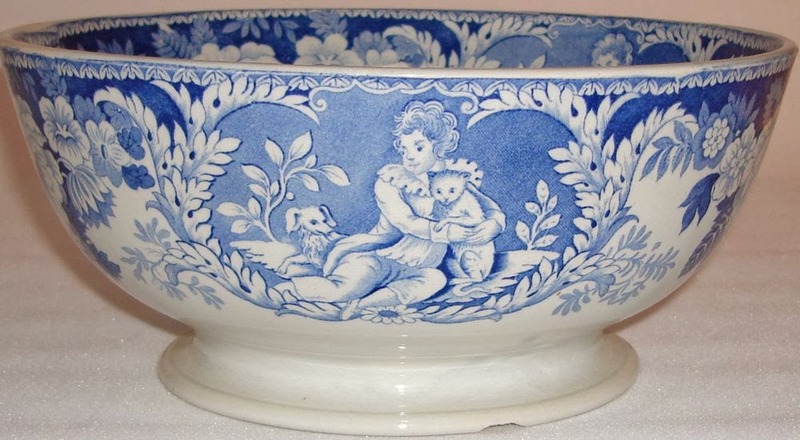 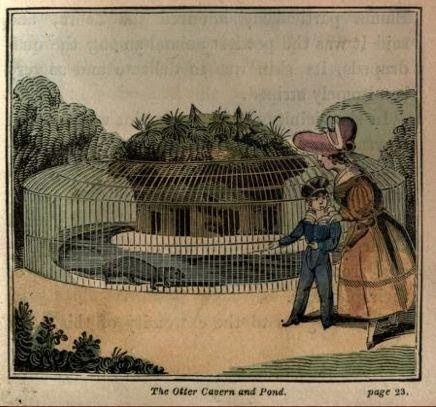 1825/I would call this pattern Trusted Friend as the dog is trusting the girl with her puppies./This pattern, of course, is not on an item intended for children. When it comes to dog patterns on transferware, you are spoiled for choice! 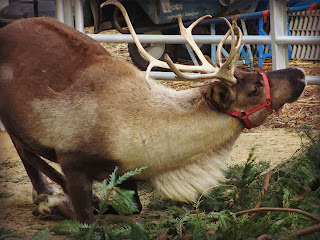 I certainly had a tough time figuring out which patterns I wanted to include in this blog post. 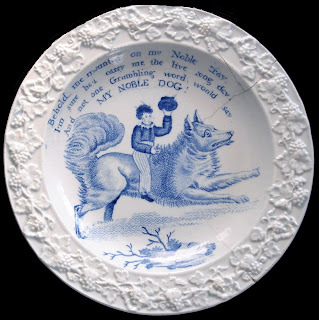 As with the cat patterns, see my post Cats On Transferware, most of the dogs appear on children's plates and mugs, but there are also many patterns on dinner services (and other items intended for adults). 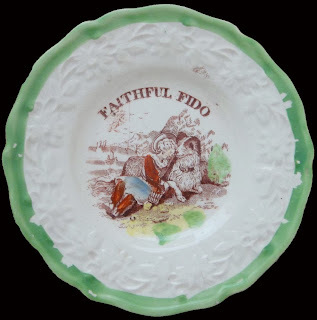 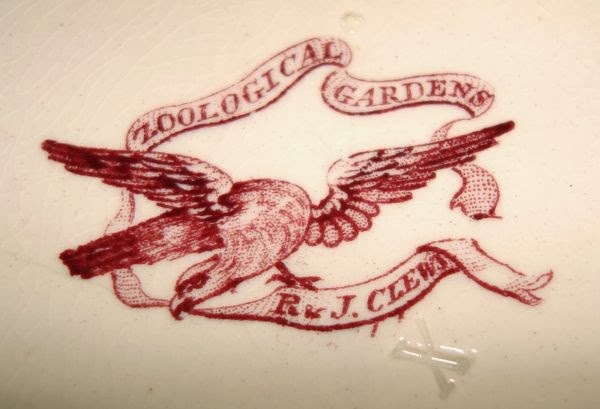 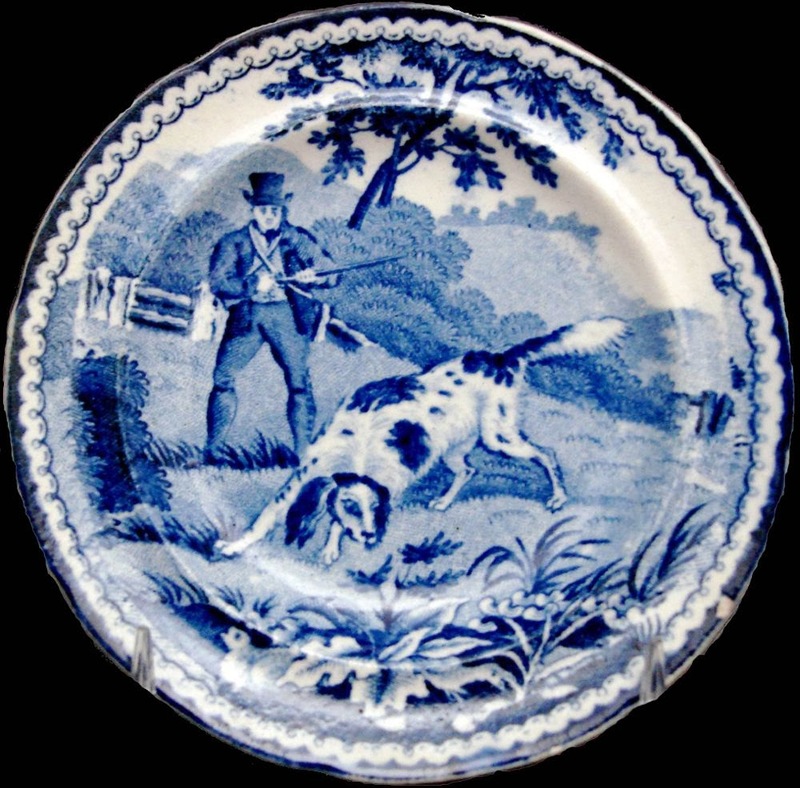 For example, the Transferware Collectors Club shows nine patterns in their database which feature dogs in Enoch Wood & Sons' Sporting Series. 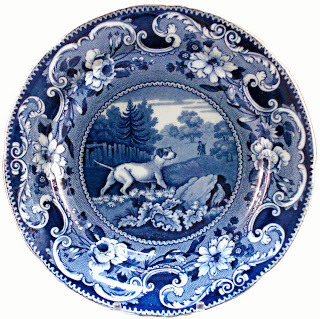 There are five patterns with dogs in the Quadrupeds series by John Hall & Sons. 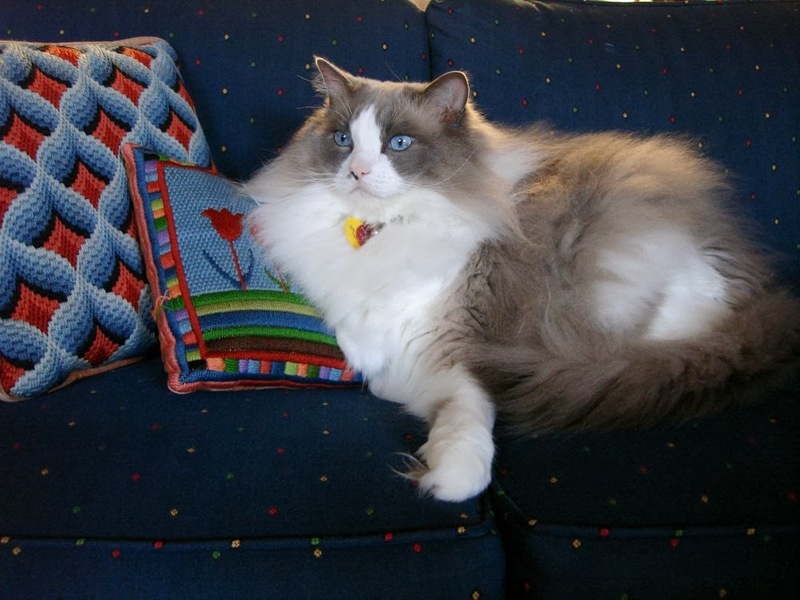 I'll show you a few of the patterns. 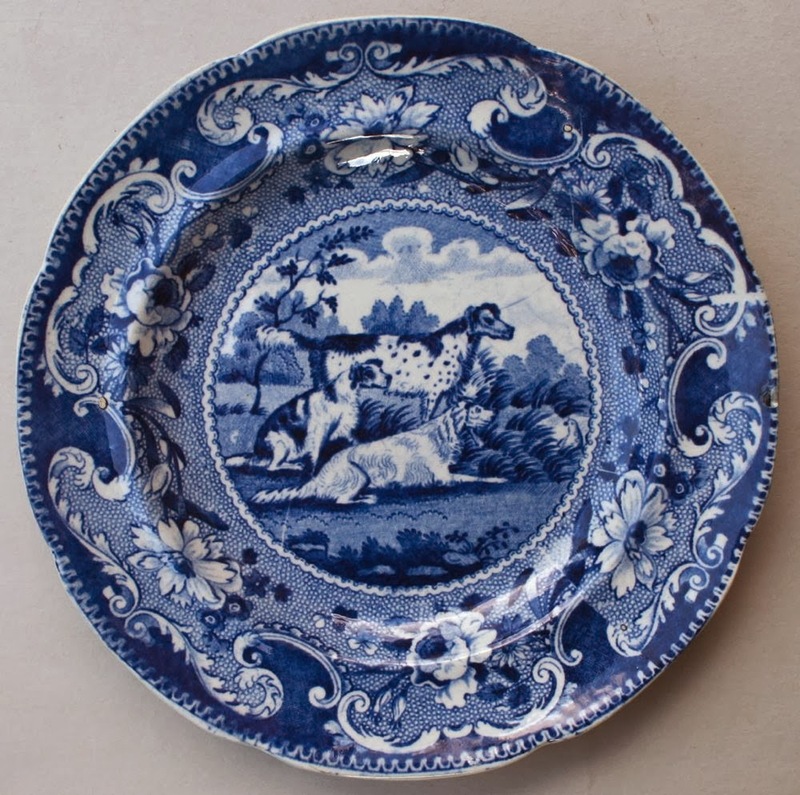 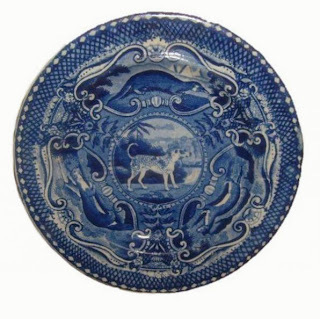 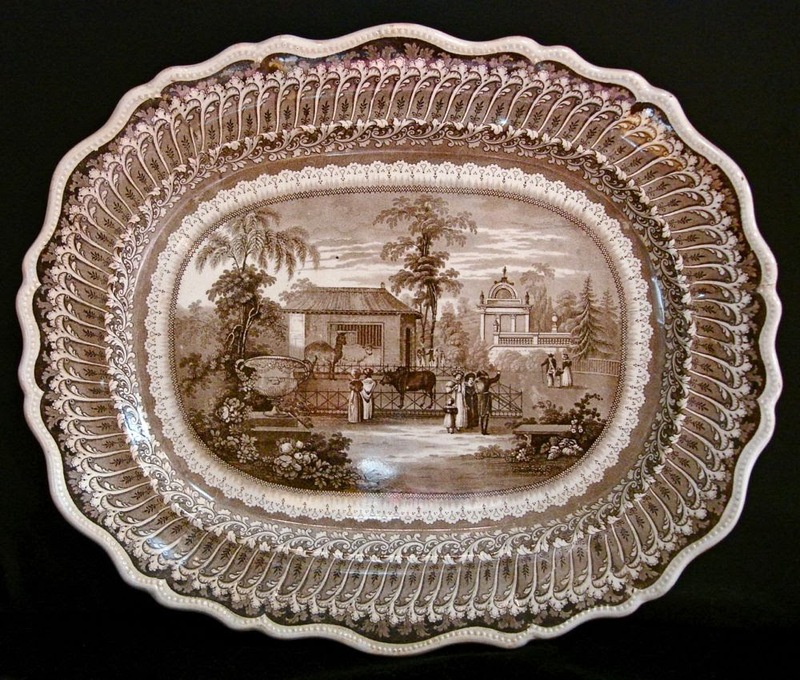 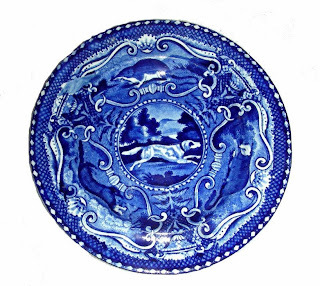 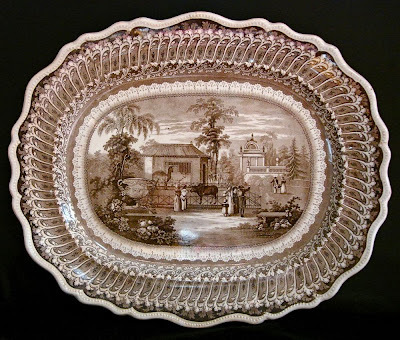 You can read more about the Setter plate seen below in my blog post titled Golden Retriever. 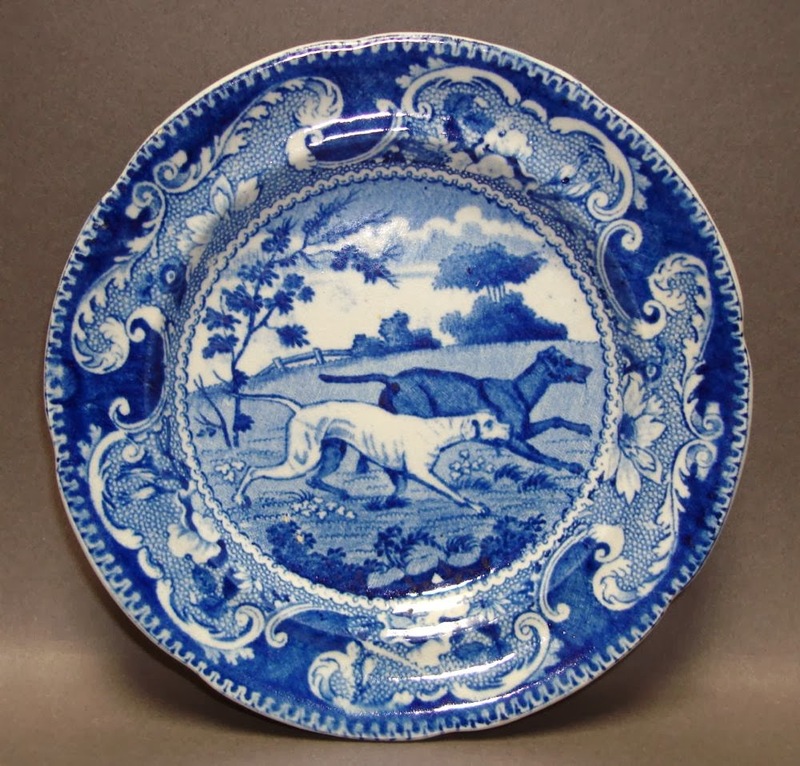 Here are a few dogs from the Quadrupeds series. I thought I would also show another dog pattern. This one was made by Ralph Stevenson (& Son). 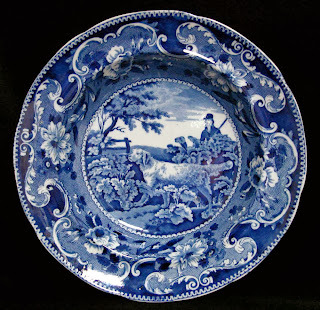 All of the items in the Stevenson service have the same central pattern. 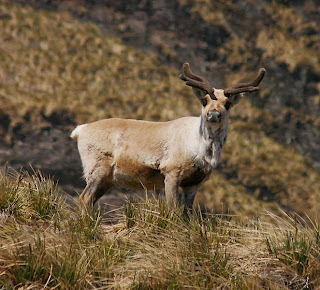 The dog is similar to Wood's Water Spaniel, but it is actually a springer spaniel. 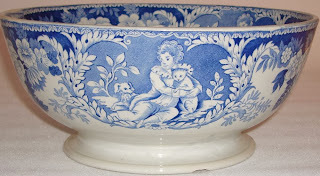 My last photo is a vignette of patterns that feature dogs. 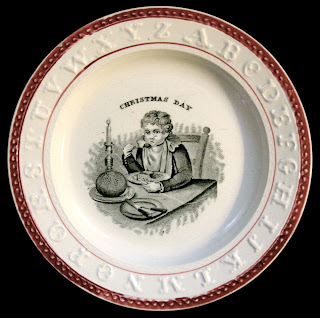 Only the soup plate is part of a dinner service, but at least all of the items were intended for adults! 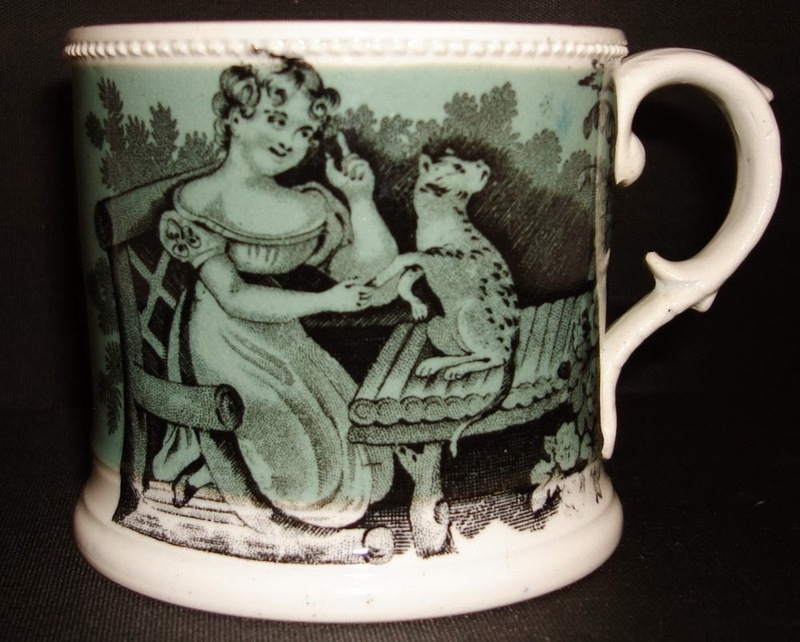 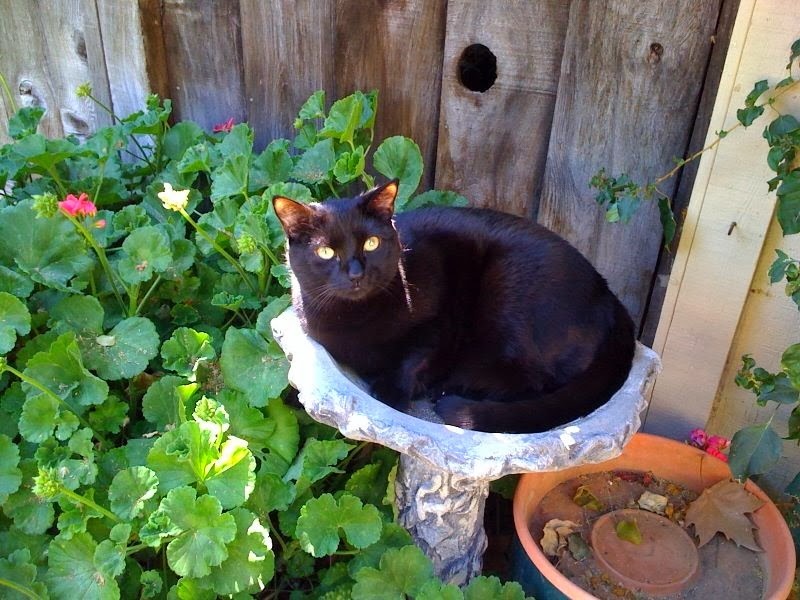 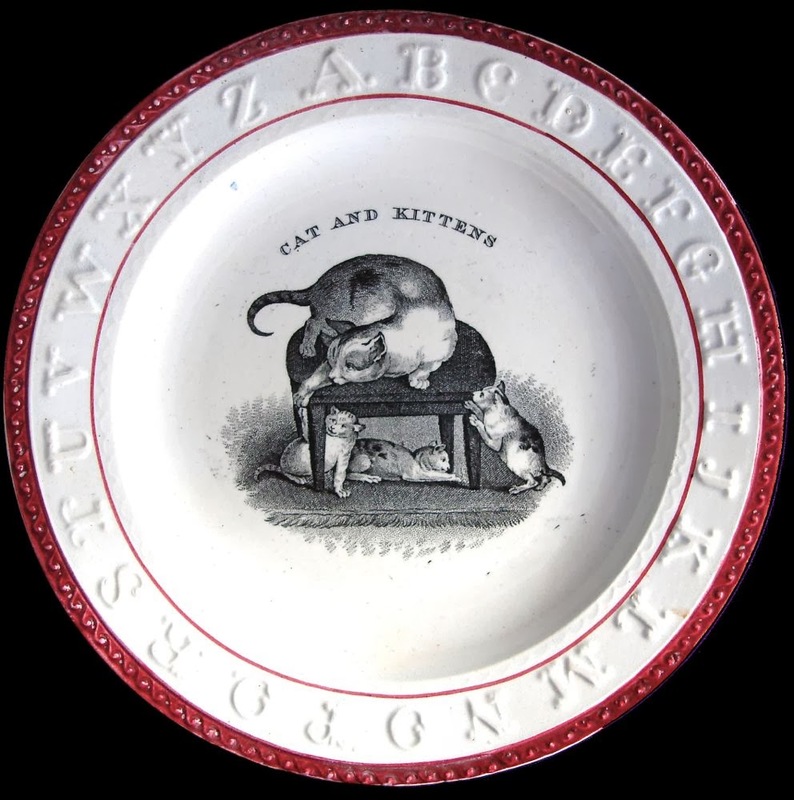 Although not as popular as dogs on transferware, cats are found on many patterns. 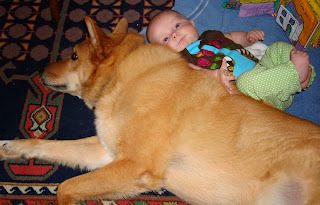 I love dogs and cats, actually any animal (perhaps not most insects or arachnids). I have noticed that most of my favorite cat patterns are found on items made for children, but not all. 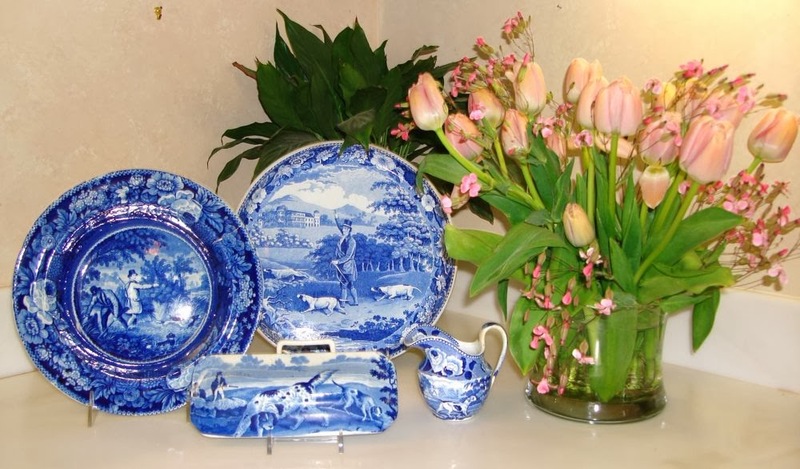 Below are some of my favorite patterns plus a few of my favorite cats. All of the china is 19th century. 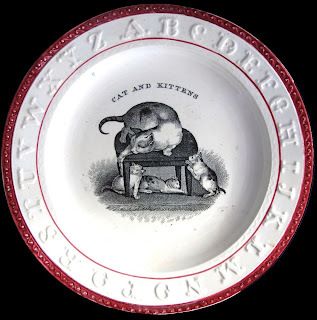 The cats are more recent. 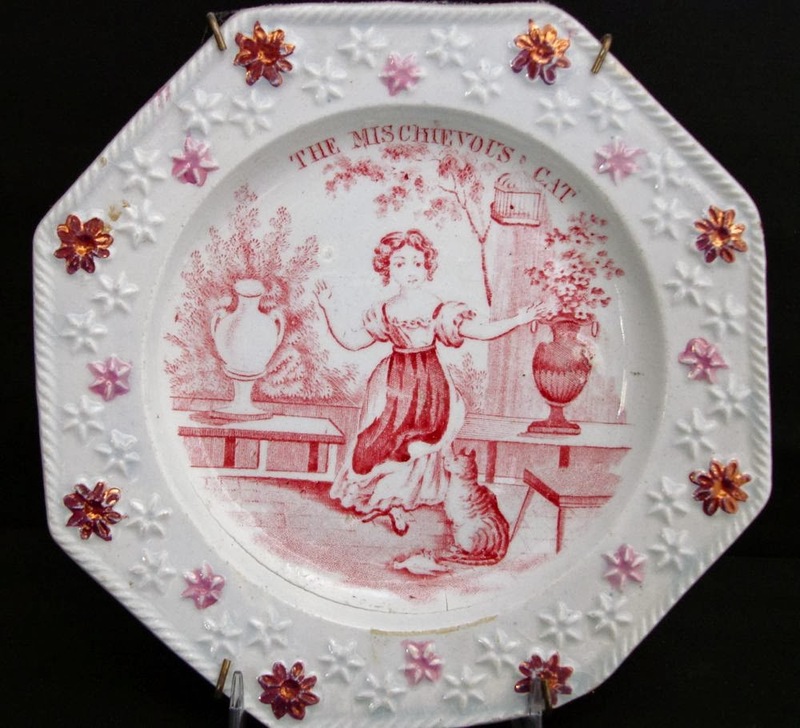 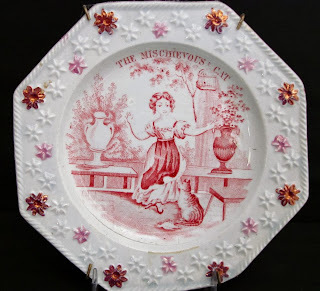 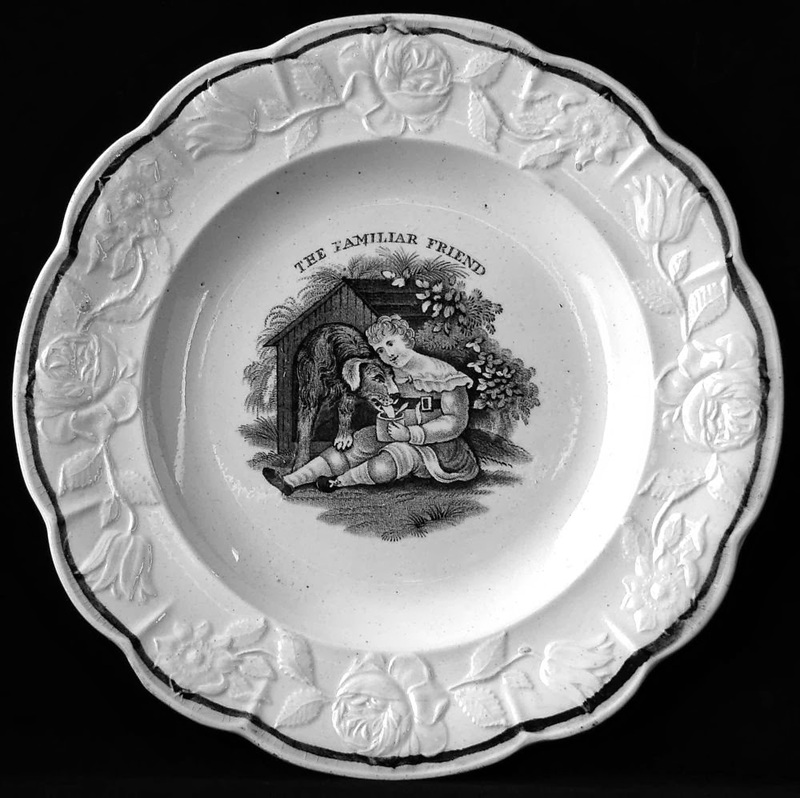 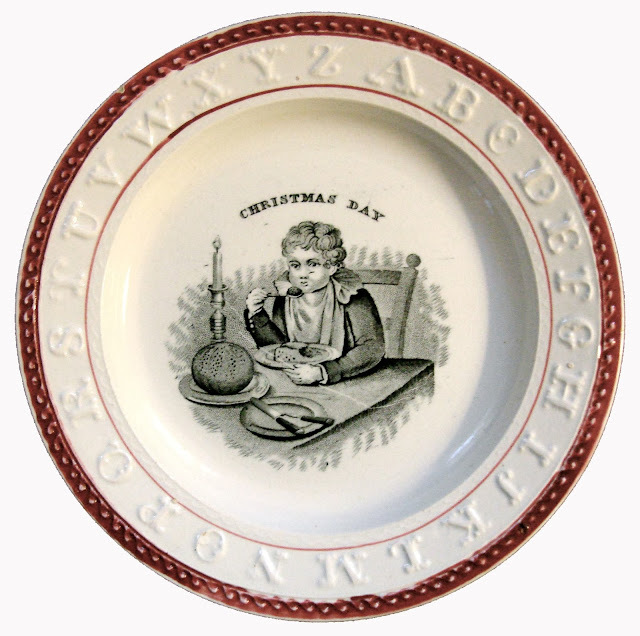 Child's plate, The Mischievous Cat, 5.5 inches/The cat has killed a pet bird. 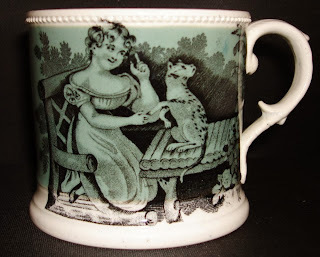 Today we might call the pattern Bad Cat! 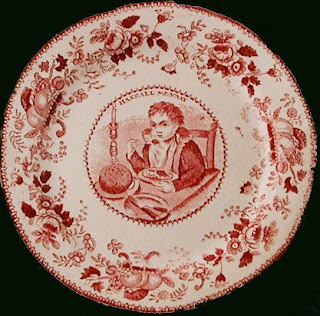 This may be another inappropriate pattern for children. 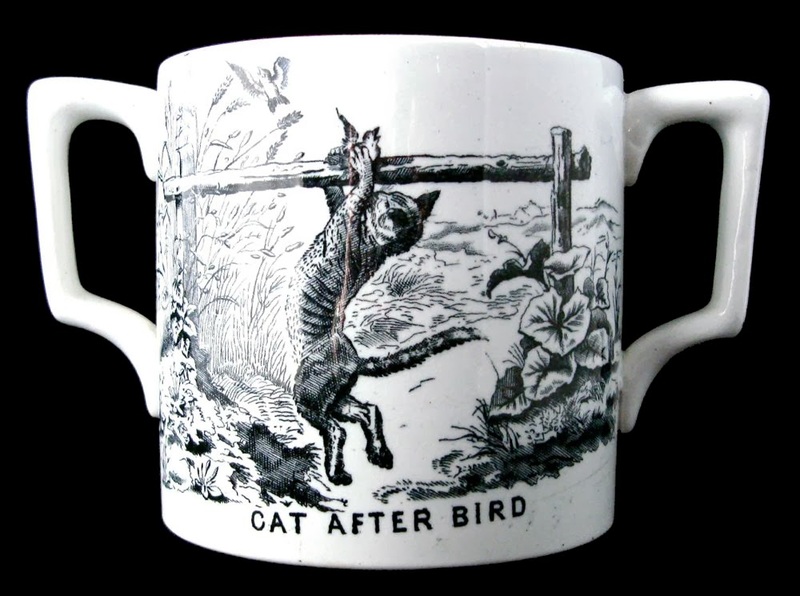 Child's mug/Do you think the girl will be able to teach the cat a lesson? 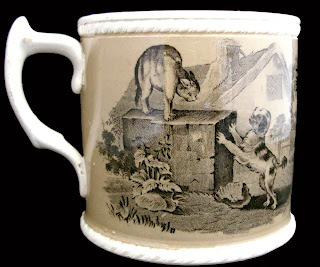 Child's mug, 3 inches high/the cat is not amused by the dog!